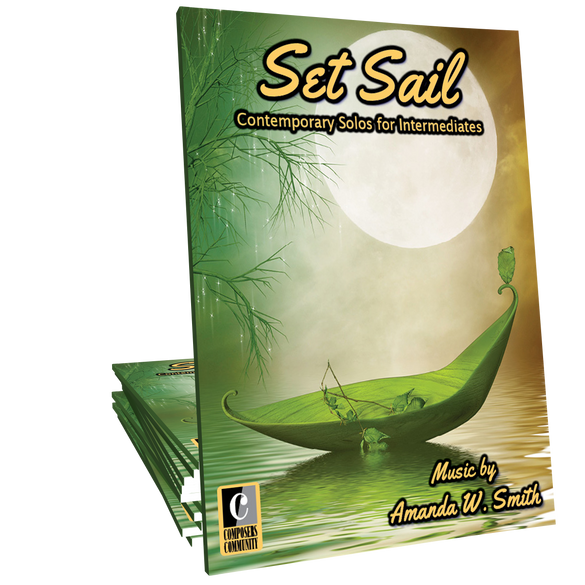 Set Sail is a collection of eleven, showcase style solos for intermediates composed by Amanda W. Smith. With a balanced mix of fast and flash, and lyrical selections, this songbook will be a favorite with students of all ages! I am really excited about this book and hope to be able to purchase it soon. I love being able to look through and listen to the music in my spare minutes at home. I can be sure what I’m getting is a good fit. Thanks JE and CC! In particular, I think Firelight Dreams is going to be a favorite. At the Edge and Far from Home are beautiful too. Amanda has included several warm, contemporary lyrical pieces great for teens and adult students, like Silver Lining. Then for a change of pace, Set Sail and High Speed Chase are upbeat and fun. I can tell already, everyone is going to love Crocodile Tears. The Knights Quest is another great one for those inspired by videogame-esque music. Really there isn’t a song here I don’t like. I see these as being motivating “reach” pieces for those just getting to this level.